Are you ready for 21st April ? Google rarely gives advanced information about changes to its algorithm. So when Google recently announced the date and focus of their algorithm changes we knew it was going to be a serious update. 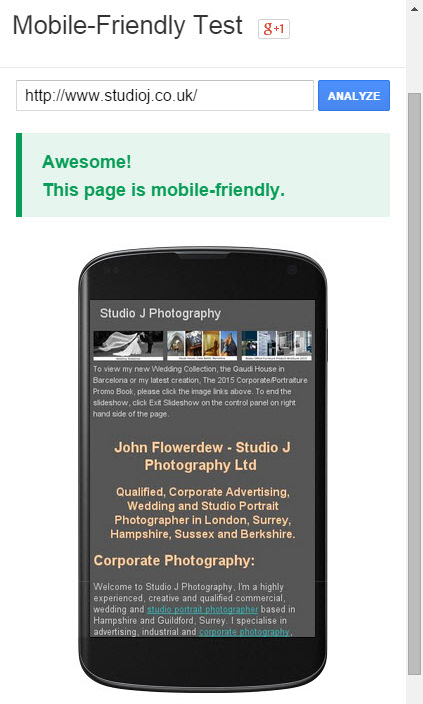 So, it is time to make sure that you have a mobile-friendly website. Google has made it easy to test things by creating a tool where you can enter your web address and get an instant result. You can try it out here: https://www.google.com/webmasters/tools/mobile-friendly/ . 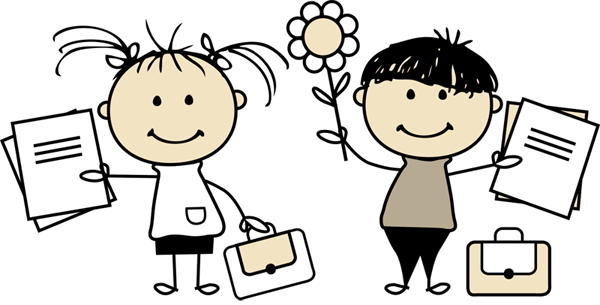 Now is the time to make sure that you are not going to be affected negatively by this update. All websites built on theimagefile system automatically have a mobile-friendly site already with mobile-friendly client galleries, shopping cart, cropping tools and payment options. 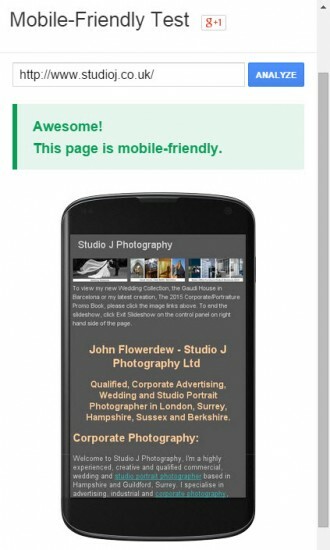 The mobile version is lean – no logos or background images – this is by design to make your site fast for visitors. make sure that you haven’t added fixed width content like a widget or table which will not display properly. If you do experience any issues you can add CSS classes to your page content to either scale or completely remove that content from your site while being viewed on a mobile device. We have introduced three new mobile-friendly CSS classes which you can assign to objects in the rich text editor. Already have your own solution sorted? On a per-website basis, you can rename your website to include “no mob” in the site name at My Websites > Use my Domain Name > Domain Name and Access (i.e. “Main no mob”). We will not use our automatic mobile-detection and presentation. You still have a month to go through things but don’t leave it to the last minute! hi James , cheers for the heads up on this ..,. Is my website ready for the changes mate ?? Thanks for your comments. Yes your site on theimagefile is already mobile friendly, in fact when I search your site on Google it is already flagged as mobile friendly too, so you are in great shape! Some new images would be awesome. If you could upload them to a collection and send me a link I will sort it from there. Can you use, class=”tx1_flexsize” to alter the size of widgets being used? I have two widgets that host videos, that don’t appear to change size on my iPhone. All the photos now fit within the screen using the css class as above but not the widgets. Any thoughts? I have found various options on the web for handling this sort of issue. Before suggesting one a I would take advice from our dev team so will get back to you later on this. Hi James, any news? Also I have been looking at the Image File website on my mobile phone, your website looks exactly the same on a mobile phone as it does on a desktop, including logos at the top of the page. Can we not do the same? Within theimagefile the page that “Embed Youtube videos” page using the embed iframe syntax code is now responsive, as is the video shown on the “Video from My Images” web page. When in mobile mode we hide any border and display the video at 100% width. Remember you can still use the special mobile CSS classes to display one video on your desktop version and a different video on the mobile version too. Regarding making your desktop site show on a mobile… yes you can do that but at an SEO cost (just rename your site at My Websites > Use my Domain Name > Domain Name and Access to include no mob (e.g. change Main to Main no mob). We would strongly advise you to not do this unless your site is already mobile friendly and your client galleries are all within password protected areas.